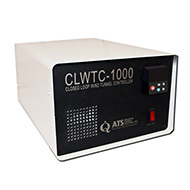 Custom built for the CLWT-067™ and CLWT-115™ closed loop wind tunnels, the CLWTC-1000™ is designed to automatically control the air flow and temperature through the test chamber. The controller is operated with a Windows PC (not included) to manage and measure air speed and air temperature, and to obtain continuous data on the devices under test. The CLWTC-1000™ controller features easy to use StageCONTROL 1000™ software, a version of the proven software used with other ATS wind tunnel controllers. The controller provides the PC with a functioning Data Center for viewing information and monitoring events. The user can set a range of velocities at different temperatures from the software to run the wind tunnel automatically. The CLWTC-1000™ also has manual controls to raise and lower the air temperature, in addition to changing temperature via the PC. It is highly recommended that users of the CLWT-067™ and CLWT-115™ utilize the CLWTC-1000™ Closed Loop Wind Tunnel Controller as it automates the control of temperature and velocity automatic and minimizes the chances for errors using multiple and/or less capable controlling devices. The CLWTC-1000™ interface is compatible with any Windows PC.